Think about your favorite film of the last ten years. We all have at least one film that we followed from production to execution. This is a film that you've read the book of, or you love the characters involved. Perhaps it's an actor involved that you are a huge fan of. Now imagine sitting in that seat, opening night. The curtains come down and you are bouncing up and down with excitement. When the lights go up at the end, your heart sinks because it was perhaps the biggest let down you've experienced in quite some time. Now apply what I've just said to Aliens: Colonial Marines and you have an idea of just how bad this game is. Before I get into just how disappointing Aliens:Colonial Marines actually is, I have to put out there that I'm a huge fan of this franchise. The Xenomorphs scared me as a child, and in my teens I grew to love the mythology surrounding this series. With that said, I had nothing but high hopes for this game. Sadly, it disappoints on almost every level. It is a shame, because the opening fifteen minutes of this game are pretty decent. The game starts with your team of marines entering the ship Sulaco, the ship that, as you know, where the events of the film Aliens takes place. You will walk right by the lower half of Bishop's body, you will hear numerous mentions of Ripley, but then the game does something that it just shouldn't: it completely rewrites franchise canon. Now, for a refresher, at the end of Aliens, Ripley, Hicks, Newt, and what's left of Bishop are able to escape and are shown going into cryo-sleep as they head towards earth. That's not the case anymore, as well everyone has escaped, one person apparently didn't. One of those four characters I mentioned above comes into heavy play at the end of this game's campaign, and when asked why that person is present they simply respond “that's a longer story”. Are you serious? I clocked in my playthrough of Aliens: Colonial Marines's single player campaign at just under five hours. Normally, I'd be pretty upset that this game is short, but considering how much of a mess it is, I can't really argue that point. After a promising opening, I encountered my first major glitch of the game. My sole A.I. partner decided to get stuck in between a door, allowing himself to not be able to complete an important mission objective. This happened over a dozen times, resulting in my death from endless waves of xenomorphs. It got so bad, I questioned if I should restart the game, but I was finally able to get past the glitch. Remember Xenomorphs? As a child, they scared the hell out of me. In my teens up until now, they fascinate me. 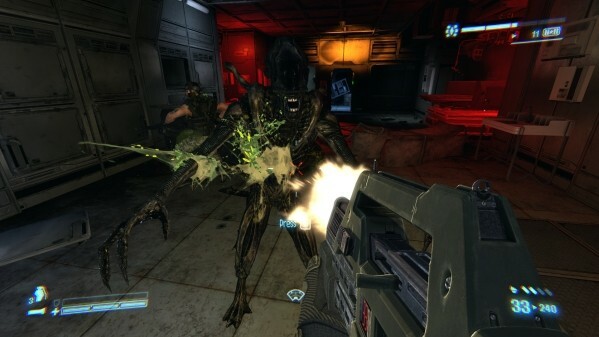 Aliens: Colonial Marines takes on the almost impossible task of making Xenomorphs no longer scary. Instead of sticking to the shadows and fighting you with even a sense of intelligence, the Xeno's decide to attack you in common waves of endless attacks. Xeno encounters become so common that you will find yourself bored after the first mission. However, when not fighting them, you will start fighting Weyland-Yutani mercenaries. These encounters invoke memories of Doom 3, except ten years ago that was a great game. In fact, if you were to strip away the Aliens license, this game becomes nothing more then a really bad Doom 3 mod. Except, Doom 3 is more intuitive. Rather than just run over item and ammo pick ups to pick them up, you have to highlight them with your crosshair, and press the use button to pick them up. This feels like a complete step back for the entire game, and first person shooters all around. Putting the glitch aside in the first level, I found myself enjoying the game after finishing the first level, but then I pressed on. The remaining four hours of single player campaign had me shaking my head, questioning just why Gearbox released this game so unpolished. Some cutscenes are so bad they drop into single digit frame rate territory, and I even experienced the dreaded audio glitch where mouths don't match up with words being spoken. If enemy A.I. is dumb, then the teammate A.I. has to be some of the worst I've seen this generation. Explain to me how my teammate is wielding a smart gun (a gun that auto aims for you completely) and can't kill a single enemy? How about when you have more then one teammate with you and they both get stuck on parts of the environment, leaving you to yourself? Did Gearbox even playtest this game before release? Aliens: Colonial Marines never feels like more then a terrible debug version of what it should be. And what's your reward for sticking around through the end? Well, the story just kind of ends. The wrap up in this game has to be the most rushed, worthless, and overall disappointing endings to a video game story I've seen. There is literally no payoff to sticking with the campaign story of this game. And for all the Alien 3 haters out there who had hope that this would be the metaphorical band-aid for that movie, look elsewhere. If the single player is this bad, let's talk about the horrible multiplayer. Yes, the one part of this game that other people have stated is ok, is not. In many ways, multiplayer looks even worse graphically then it's single player counterpart. The xenomorph and marine animations look clunky and choppy. And balancing? What balancing? If you play as the marines, you will win. Play as the Xenos, you lose. It's that simple. If you are playing on the alien side of things, you will die in one to two hits. Sure, you have some cool attacks, but by the time you are able to pull one off, the enemy you are aiming at has either side-stepped and shot you to death, or you simply miss and get killed from behind. However, every time I played on the marines side, I won. Even though there are four multiplayer modes offered here, they all might as well be team deathmatch, because that's what they are. I really wish that Gearbox would stop picking up games that were on the verge of cancellation and rushing them out for profit. Duke Nukem Forever was a bad game, but I knew that going in. Aliens: Colonial Marines looked promising, but at the end of it, all the evidence stacks up to making it very clear that Gearbox did nothing more but added a multiplayer component to this broken game and shipped it, hoping that the renewed popularity of this franchise (thanks to last summer's excellent prequel film, Prometheus) will sell copies of this game. This is the second time Gearbox has let me down in the past few years, and I don't think I can trust them anymore at this point. Aliens: Colonial Marines is nothing more then a broken mess of a game that shouldn't exist. Do yourself a favor and pick up the Alien Anthology (Prometheus as well); have a marathon with those. You can get all of that for less then the price of this game, and have a much better time then this game. Avoid this, like a plague.